Lately, I’ve really been hitting it hard at the gym and I thought you might find it interesting what I all carry with me in my gym bag! There are a few things here and there do change depending on the day. Occasionally I’ll only take my Yoga mat to the gym if I’ll only be going to a Yoga or Pilates class. But what you see here is what comes with every time no matter what! ? Camelbak Water Bottle – I love that this has one has the straw and bite valve, it makes it super easy to grab a drink of water if I’m on a treadmill or bike. Towel – I love the small towels from Lululemon they’re extremely absorbent and I love the fun colors they have! Check out my review for them – Here! Makeup wipes, chapstick, and deodorant – Just a few must haves for keeping clean! Earbuds – Sometimes I end up with two pairs in my bag just because I prefer the pink pair over the orange (it has volume & mic controls). Both of these are made by yurbuds and I love them almost as much as I love Free Runs! 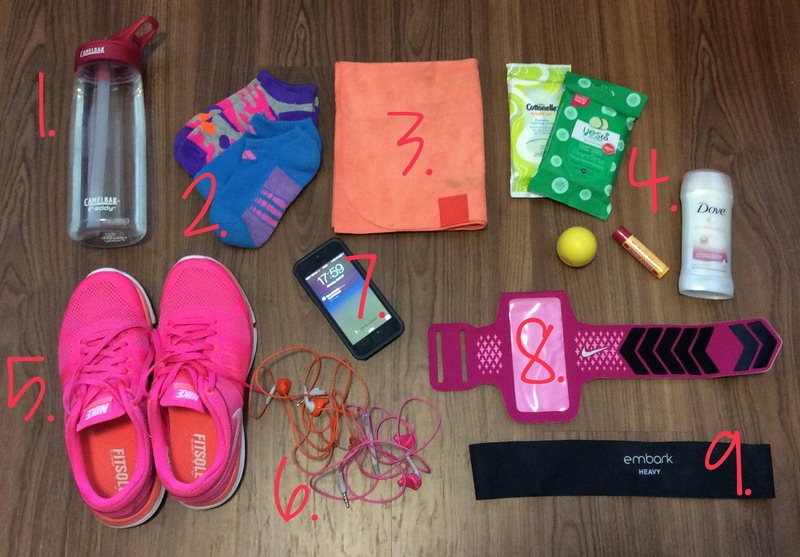 Phone – I always keep my iPhone with me for listening to music and tracking my runs & exercises. Arm band – I use this armband for almost all the exercises that I do and I love that it’s pink! Let me know what your gym essentials are! Also, are you a cardio or weights girl – or maybe a bit of both? Lets talk fitness in the comments below!